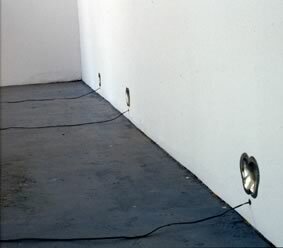 Christopher Braddock’s works in pp 10-18 bring to mind ventilation covers that are perforated in patterns of small intricate holes which in themselves recall a variety of appliances: plug holes, speakers, apartment intercoms and air ducts. Their indented forms are reminiscent of fleshy imprints that might call to mind the body. The use of these forms in multiple is echoed in the installation by a sound track of repeated liturgical verse. Braddock’s vent works (entitled Vent) are positioned low in the walls where air ducts or air conditioning vents might well be positioned. They therefore seem redolent of ideas of a passage of air or breathing the air, both in the gallery and behind the walls: a cavity experienced, not through sight, but by the notion of air travelling through it. The works seem to deliberately play on assumptions that art would not be hung so low on gallery walls and that vents do not ascribe to popular notions of what constitutes art. Most viewers, myself included, would naturally avoid misinterpreting the vent works as real vents because the objects are removed from a functional context of real ventilation covers. This is due, among other things, to the context of an exhibition and to a similarity with past works by Braddock, i.e. an association to other works previously accepted as art. These vent works could therefore be said to aspire to symbolic status. Not only are meanings amplified by associations to (but dislocation from) collectively understood functional roles, but there is also a spiraling of further interpretation around the context which results in considerations of the symbolic meaning of air, breath, wall cavities and bodily shapes. To arrive at this point leads me to speculate that the passage of air is testimony to the cavity and the idea that we experience an inner secrecy by means of the air that passes through it. One could imagine that this interpretation has ramifications for our experience of the body: we do not commonly see and experience our inner breathing organs other than by way of breath. The breath becomes symbolic of life: to breathe life into somebody. Breath externalises the precious airflow necessary for internal organs’ survival. Given that the works carry body references in their imprints of buttocks or heart-like shapes, an analogy from the body of the building to the human body would seem appropriate. These imprints are also very iconocised and one wonders at the religious aspects surrounding them. This leads me to speculate that an investigation of the body might give way to an interrogation of the body of the church and its absolutions. The use a repeated litany in this installation might be seen to parody the kinds of liberation that mantras are designed to foster. Insights such as this suggest an ironical intention and raise questions as to whether such litanies encourage exorcism or entrenchment? One could also suggest here that the artist is attempting to divert attention from a personal and uncomfortable negotiation with those very patriarchal types evident in the works. Further to this, given that childhood memories are evoked when discussing these issues with the artist, one could ask how much Braddock is aware of these dynamics in the work. Nevertheless, a point could be made here that personal recollections defer to a collective consciousness within specific cultural contexts. It has been my intention to reveal layers of interpretation. In following this process I am arguing that to pursue meaning is a process by which one problem solved discloses another and that “it is the nature of works of art themselves that they should support and favor [such a] process of interpretation” 6. The movement is outwards towards collectively understood social dimensions rather than inwards toward subjectively held private truths. 7 The limits of such interpretation depend upon cultural contingencies and an individual’s desire to know. The artist wishes to acknowledge the assistance of David Merritt in recording Vent 1999.